I’m sure you’ve heard the buzz….Star Wars: The Force Awakens is available to own (digital download now and Blu-ray/DVD this week). If you loved it as much as we did, I’m sure you’ve already made plans to buy it. If you are still waiting, grab your copy today (Amazon affiliate link). With the recent resurgence of Star Wars mania, my house has not been immune to the force. 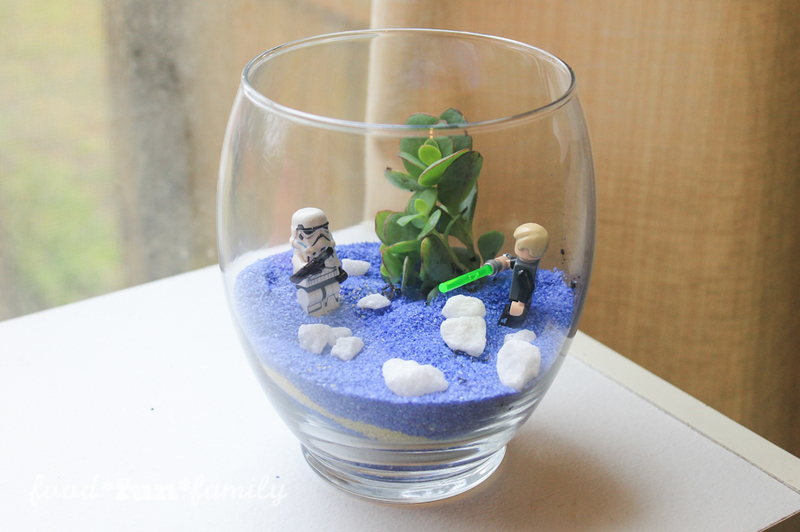 We ran out to see the newest movie when it came to theaters, we bought the Star Wars shaped food, merchandise, etc… Yet we still can’t get enough, we love them all – Luke, Leia, Chewie… We also love coming up with our own crafts and fun little vignettes. Succulents are a great plant for terrariums because they require very little care, making them great for children’s rooms. I took a trip to the Dollar Store-spent $4, plucked succulent cuttings right out of my own yard (or you can pick up some brand new ones at Walmart for a few bucks), and raided my sons Lego collection to create this fun living play space. 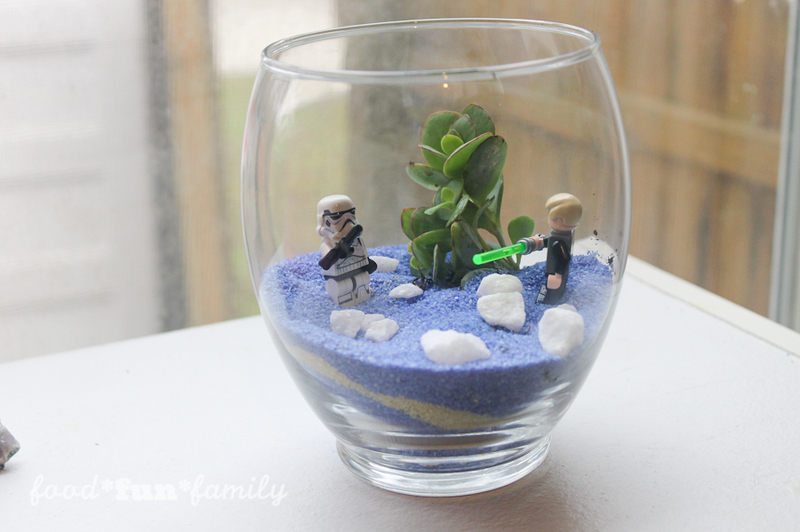 Frugal, easy, and adorable… terrariums are a great activity to create with your child. We made this one together and he loves having it sit on his dresser among all his other beloved Star Wars items. Note: I’ve included affiliate links to the supplies on Amazon so they’re super easy for you to find. If you make a purchase from my links, I get a small (and I mean small!) commission, but you pay the same as you normally would. If you don’t already have an Amazon Prime account (which gives you free shipping!) you should totally give it a try! 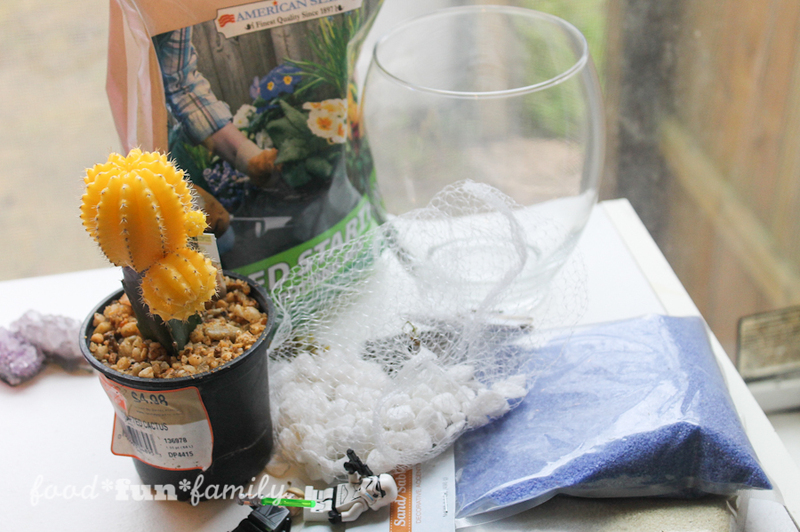 Begin by placing a half inch of pebbles or rocks in bottom of vase for drainage if needed, succulents hate to be over watered. 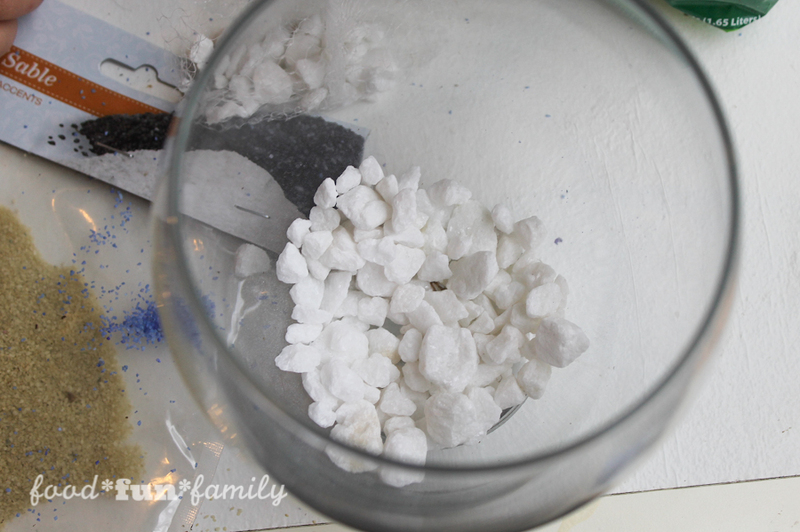 Alternate layering blue and white sand to fill the bottom third of your vase. 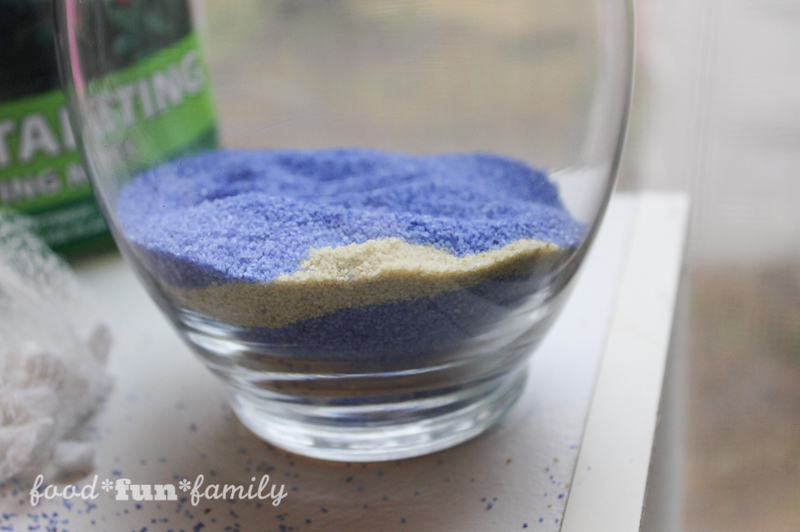 You can use any color of decorative sand you prefer- Dollar Tree usually has several options on hand. 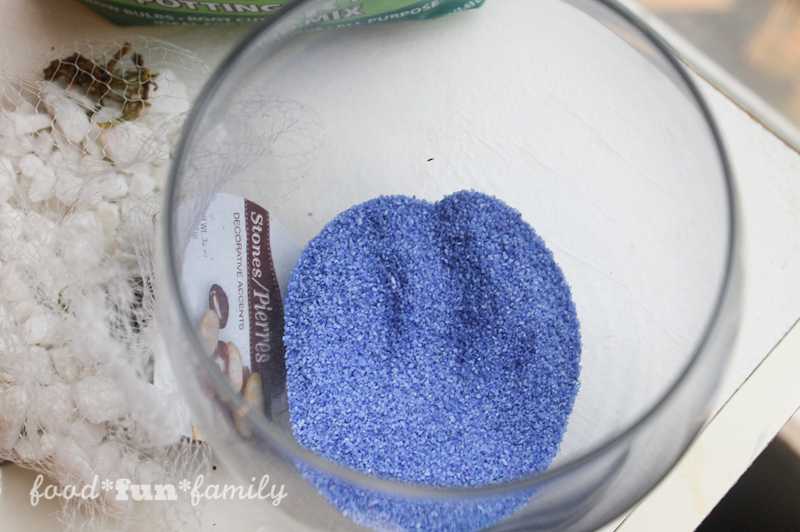 Press the roots of 2-3 small succulents into the sand, add more sand as needed to cover. 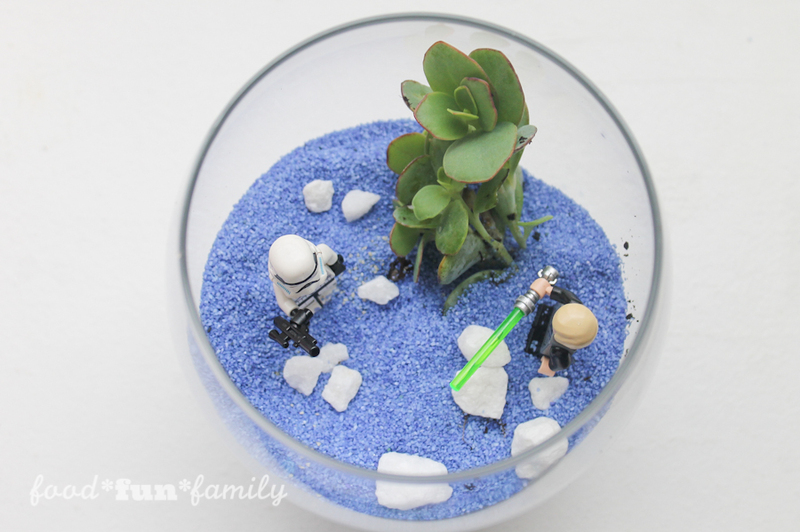 Slip in a couple small Star Wars figurines to complete your scene. Scatter a couple rocks on top to add texture. Change out your scene occasionally to mix it up! 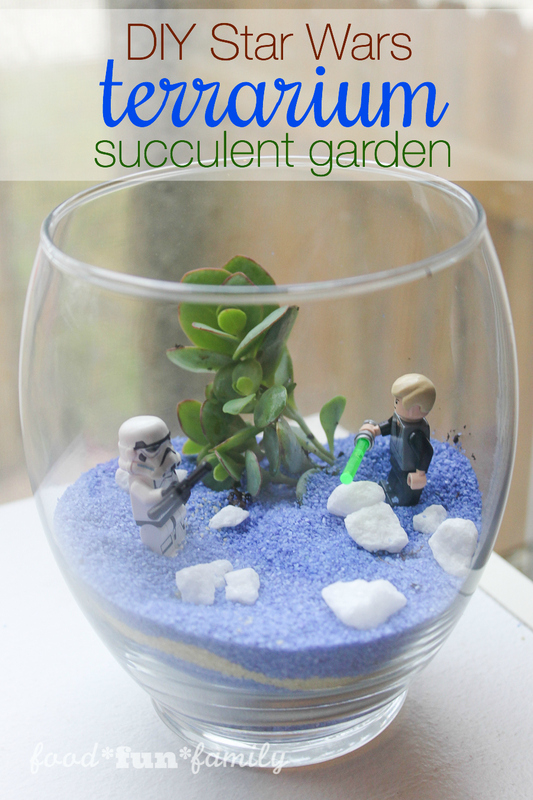 Enjoy your new Star Wars succulent garden! This is a pretty neat idea! My son would making one of these for his room. Well, you could always buy some of your own figures. ;) Thanks for stopping by! This looks so cool (do people still say cool?!) Do you know how long will the succulent last without any soil like this? I know they are pretty tolerant but I would think they need some soil for food etc, or can they live ok like this in the sand? If they last ok this would be such a fun project, I’d be tempted to play with the figures everyday though! Thanks Lolli, some of our succulents, like aloe, throw out so many babies that I could easily risk them not lasting too long, then if they do it’s a bonus! I asked my 17 year old son if people say cool and he it was “all right” for me to say but I’m not sure what that means!